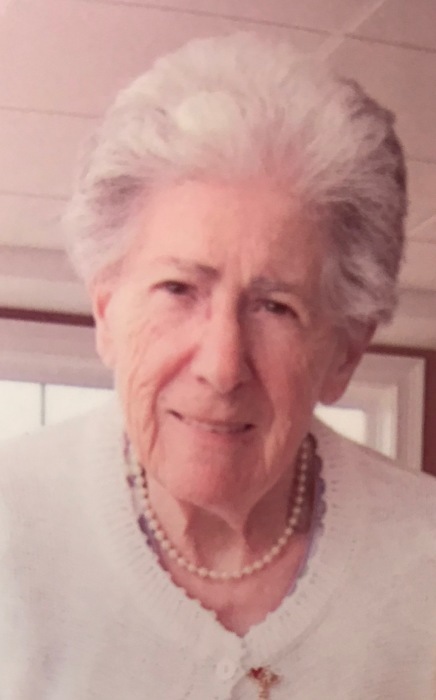 Giovanna “Jennie” (D’Angelo) Finiello, 96 of Whitman formerly of Dorchester passed away April 1, 2019 at her home surrounded by her family. Wife of the late George V. Finiello. She is survived by her children John L. Finiello of Hanson, Elena Finiello of Marshfield, Jean O. Finiello of Whitman and the late Jerome P. Finiello. Grandmother of Andrea Devoe and Amy Finiello. Great-grandmother of Vinnie Jr. and Nora Devoe. Jennie was born in Boston, and grew up in Dorchester. She moved to Whitman in 1961. She worked serving lunches in the Whitman Schools for 18 years. She was a volunteer at the Whitman Senior Center. Jennie loved to travel, spending winters in FL and some summers in Italy. Most of all she loved cooking for her family, which she did every Sunday. Relatives and friends invited to visiting hours in the MacKinnon Funeral Home, 760 Washington St., Whitman on Thursday April 4th 4-8 pm. Funeral Mass Friday in Holy Ghost Church, Whitman at 9 am. Burial to follow at St. James Cemetery, Whitman. The Finiello family would like to thank Beacon Hospice nurses and staff especially her aide Christina for all their care. In lieu of flowers donation may be made in her memory to The Cam Neely House, 30 Winter St., 2nd Flr., Boston, MA 02108.